God has placed wonderful callings on women. He has called us to be nurturers, homemakers, teachers, sisters, daughters, wives, mothers, and grandmothers. Special traits, talents, and gifts have been placed in each one of us to make a difference in the lives of others. God put them there. He gave according to the plan He has for us. The road He has mapped out for each one of us is like no other. No two are the same. We each have to walk out our own path in our own ways. Because we are women, we aren’t afraid to ask for help, or to ask for direction. We build relationships easier than men. There is a lot of talk about being part of a “brotherhood,” a common term is “a band of brothers.” I think the men of the Kingdom of God need that! For the most part we women have already had it. If we don’t let our lives get too busy and bog us down, if we don’t let Satan distract us. There is something for all of us to do in the body of Christ! We can teach each other so much. We can encourage one another and impart some wisdom. We are to love our husbands and children, be sensible, pure, do our work at home, be kind, and stay submitted to our husbands, as the head of the house. Notice that there are a few things we aren’t supposed to do as well. Both verses talk about slander and malicious talk. Women tend to love gossip. Stay away from that. I even think you should stay away from those “Reality shows” and tabloid magazines, sometimes even Yahoo news. They are all about revealing the unsavory parts of someone’s life. Don’t be a part to that, even if it is just watching it. We also need to stay sober, honor God, and not dishonor the word. Sometimes as mothers, we want to leave all the discipline to our husbands. I think that as parents we have to show an undivided front. We both need to be part of this process. Remember disciplining is not the same as punishment. In disciplining our child, we teach them. We don’t leave them to their own devices. Foolishness is bound up in their hearts! Their ways are crazy and sometimes dangerous. So we put boundaries, expect them to respect them, and then give a consequence if they do not, and sometimes that rod of correction needs to meet their seat of understanding! It works. The best way to “train up a child” is to set a Godly example. Even if our kids are grown, there are other people’s kids that are watching us. When we mess up, fess up. Be real. Don’t use that as an excuse to vent and apologize, but we all make mistakes. Notice it doesn’t say “yell and scream at your child and expect them to change.” We deal calmly with anyone we need to correct. Sometimes we may have to raise our voice to get their attention, but losing control of our own emotions isn’t teaching them self-discipline. The Proverbs woman takes care of her man, her children, and her servants. I love that she has servants. That means she has money. She, unlike modern women, doesn’t work outside of the home. However, she does work. She oversees her household, delegating tasks. Then she sells her wares that she has made with her own hands, buys property and is NOT stressed about the future. She lives in a way that people notice, for good, and her family can be proud of her. How many of us have had our children tell us, or have overheard a conversation where they are bragging on us? Doesn’t that just do something in a mother’s heart? Or what about a heartfelt show of appreciation from our husbands? Those are reasons enough to live right, but pleasing God is even higher on the list. Let’s face it, more often than not, our days aren’t filled with praise and appreciation. Most days our toils go unnoticed or taken for granted. On those days, remind yourself that you are doing it for the Lord, and that no matter what, the day will come when your family will notice and be grateful. On our 25 wedding anniversary, we celebrated by renewing our vows and having a reception at our Church. As we were leaving (first time I didn’t stay and help clean up after a Church function) my daughter came running out to the car, crying, and was able to choke out something like this, “I just wanted to say that I am so thankful that the two of you stayed together all of these years and were such great examples of love to me.” It may take years, but they do notice. Being a woman is a gift! I love being a woman. We can be girlie-girls, love makeup and clothes, and we can be strong and courageous, defending our family like a mama bear. 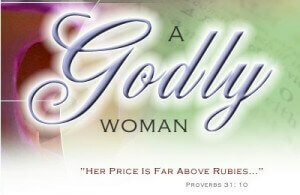 God has gifted us, anointed us, and ordained us as women. We aren’t competing with men, despite what the “women’s liberation” group may try to convince us of. We work along side them, as help mates. Together as a team, we work the work of the Kingdom. Do men sometimes get paid more? Yes. Do they sometimes get more recognition? Yes. Is that really important to the Kingdom? NO! Use the gifts God gave you, to the best of your ability, and don’t worry about the rest. God has your back.